Metso will supply crushing, screening, grinding and filtration equipment to Aguas Teñidas Mine, part of Trafigura Mining Group, in southwestern Spain. The delivery will be completed during the second quarter of 2014. The value of the deal, the fourth one between the two companies, will not be disclosed. The order is included in Metso Mining and Construction's third quarter 2013 orders received. The 2.2 million tons per year underground mine and concentrator produces copper, zinc and lead concentrates, also containing limited amounts of gold and silver. The mine's owner, Trafigura Mining Group, is planning to invest over EUR 300 million in the asset over the next two years, creating one of the largest mining operations in Spain with the highest standards of production and innovative technology. As a result of this expansion, the life of the mine is expected to be extended to 15 years. Recent exploration has discovered sufficient mineral seams to justify expansion. Because of this, a new treatment plant will be built over the next 24 months. The new plant can process twice the current amount of ore each year. The ore is exported from the ports of Huelva and Algeciras to northern Europe. 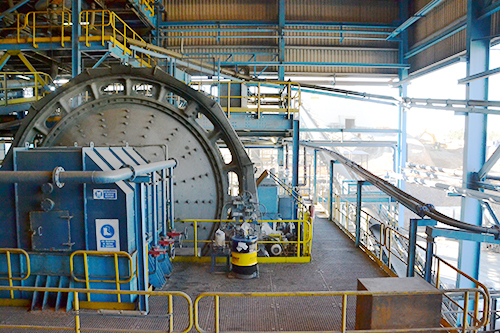 Metso has been closely involved in the Aguas Teñidas expansion project since the beginning, both on process design and sizing of the comminution and minerals processing equipment. Metso's delivery comprises a new tertiary crushing plant system with two HP4 cone crushers, one MF 3.6 x 8.5 DD mining screen, conveyors and all ancillaries. In addition, the delivery includes two 15.5' x 27' 3,000 kW ball mills, ten SMD-355 E new-generation stirred media detritors and two VPA 1530-60 filters for dewatering of the zinc and lead concentrates. For the new tertiary crushing plant system, Metso's delivery includes basic and detailed engineering projects, the complete crushing system with erection and commissioning. Aguas Teñidas Mine (MATSA), located on the Spanish side of the 250 km long Iberian Pyrite Belt, is an active mining district since Phoenician times, over 2,500 years ago. It is part of Trafigura Mining Group, which was established in 2012 as a wholly owned subsidiary of Trafigura to oversee Trafigura's mining assets. Trafigura is a global leader in international commodities trading and logistics with revenue of EUR 90 billion in 2012. The Mining Group's strategy is to grow organically and acquire operational control of mining assets worldwide that complement Trafigura's trading competencies and international presence. The Mining Group is currently active in South and Latin America, Europe, Asia and Africa.